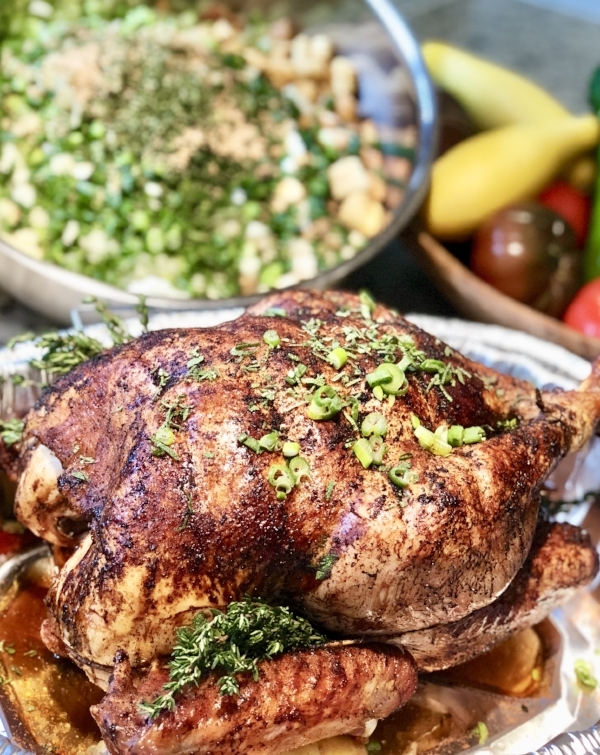 Chef Juan wanted to take this opportunity to share with you his tips for how to season, cook, and present a deliciously moist turkey that will thrill your family and guests. to the hot liquid and return to a boil. After twenty minutes remove from the heat and steep until cool. Strain the tea through a fine tea strainer and then coffee filter. Stir in the honey until it is dissolved. Dispose of the solids and place the liquid in the refrigerator until chilled. To brine the bird dissolve the salt and sugar in a large plastic container of cool water. Soak the thoroughly cleaned and plucked turkey in salted water in refrigerator for a minimum of one hour but no more that eight hours. Remove the bird, rinse, and place on a wire rack. Pat dry. With a “flavor injector” (a large syringe device) liberally inject the tea mixture deep into the breast, thighs, legs, and wings. Let the turkey rest for ten to fifteen minutes to allow the tea to be absorbed into the flesh. Combine all ingredients for the rub coating in a bowl and liberally rub the skin of the turkey. Be sure to thoroughly coat the inside of the cavity. Truss the breast and legs and tuck the wings underneath the bird. Place the turkey, breast down on a metal rack in a roasting pan to allow air to circulate completely. This allows the bird to cook evenly and the breast to remain juicy. Put turkey into a pre heated oven set to 375 degrees. Cook at 375 degrees for 45 minutes. To finish, flip the bird breast side up. Pat dry with paper towels and give the turkey a coating of spray shortening to ensure an even browning. Reduce heat to 325 degrees farhenheit and roast another 45 minutes or until the color is golden brown. Check for doneness with a thermometer. The turkey is done when the temperature is 175 degrees farhenheit in the thigh and 160 degrees farhenheit in the breast. Remove the turkey from the oven and let it rest about 15 to 20 minutes to reabsorb the juices. Serves 10 to 12 persons. Chef Juan Montier assures us that it is all about technique! For step-by-step instructions for the Chef Juan turkey carving technique, follow Chef Juan’s steps below. · Gently loosen the skin with your fingers. Take your time and do not tear the skin. · Separate the skin from the meat all the way to the bottom of the breast and from front to back just above the leg. Ready to schedule your next event? Chez Montier is a chef-driven, boutique catering company. We believe every event and party should be a joyous celebration of life. We create incredible food, beautifully presented and flawlessly served. We combine that with floral arrangements, lighting, and event décor - all designed to create one of a kind experiences and memories that last a lifetime.